As the title suggests, this view across Darling Harbour was made from a rooftop vantage point on Clarence Street, between Sydney Town Hall and Market Street. It captures a pivotal time in the transition of Darling Harbour from working port to tourist centre. Clearly visible are the signs of maritime infrastructure; warehouses, wool stores and flour silos built around the busy wharves that once serviced Sydney’s coastal and Pacific trade. Dominating the skyline is the Pyrmont Power Station, while the 1902-built Pyrmont Bridge, shown with its swing span open, leads towards the Montgomery Hotel, now the Pyrmont Bridge Hotel. Artist Jeff Rigby’s interest in the built environment and marine subjects is evident here. 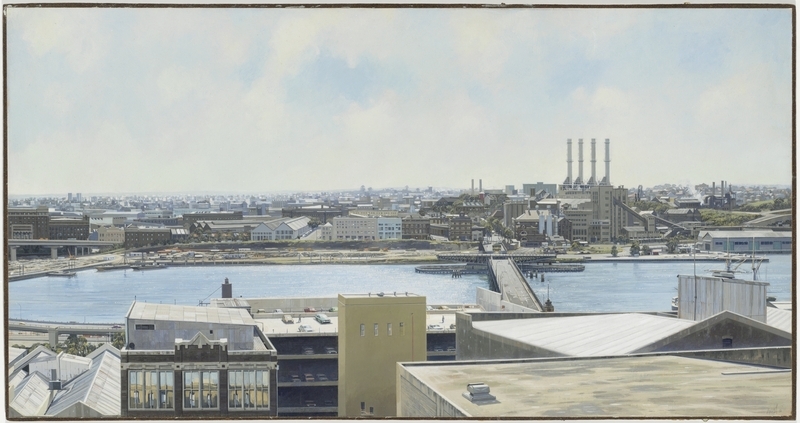 Completed in 1986, the painting shows the former wharf-side goods railway yards as a construction zone during the development of the Darling Harbour entertainment precinct. To the right of the Pyrmont Bridge is the site of the future Australian National Maritime Museum, opened in 1991.